DUOCAM® is a technology allowing the separation of two different blends into the same sachet. Useful to increase stability and avoids direct contact of nutrient that could negatively interact with each other. DUOCAM® all new technology that can be applied to finished products formulated as SACHET. The sachet is opened like usual and the contents are poured in water as usual but contains 2 separate compartments containing different blends. The aim is to separate active ingredients that have to act together once ingested but do not have to react before into the dosage form. 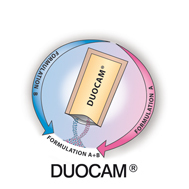 DUOCAM® was initially developed for grant stability of pro-biotic with other ingredients. The shape externally is the one of a traditional sachet, white or color printed. Inside an interposed sheet seals in two different compartments two different powder mixes, and grants that reactive ingredients never will be in contact during shelf life. Each application of DUOCAM® on finished products is branded and could be protected by patents issued or pending. The technology has required a completely new machine for producing the duocam sachets, that only SIIT at present has placend in its Plants.